DRESSCODE: Steampunk, Goth, Victorian, Endzeit, Cyberpunk, Boheme, Ballroom, Gala, Burlesque, Masquerade… No streetwear. Das Publikum wirkt mit bei unseren Veranstaltungen! Zieh etwas an, in dem Du in einem Theaterstück oder Film mitspielen würdest. In dem Du fotografiert werden möchtest. In dem Du Dich wichtig genug fühlst, Deinen Platz auf dem Planeten Erde zu verteidigen! Sei Weltrettend, Geheim, Zeitreisend, Alien, Assassine, Superheldig, verrückt Erfindend, Aufziehpuppe, das Unbekannte Erforschend, oder einfach das Schönste auf einem rauschenden Ball. Thus, adapt your dresscode to the glamourous, adventurous, practical, utility style, and show all the devices you have. We’re on the run now. It might be the last party on Earth. 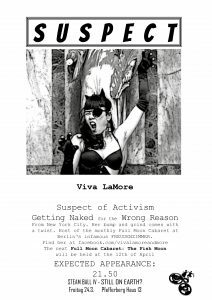 IV – March 24th 2017 – Pfefferberg Haus 13 – Still on Earth?! 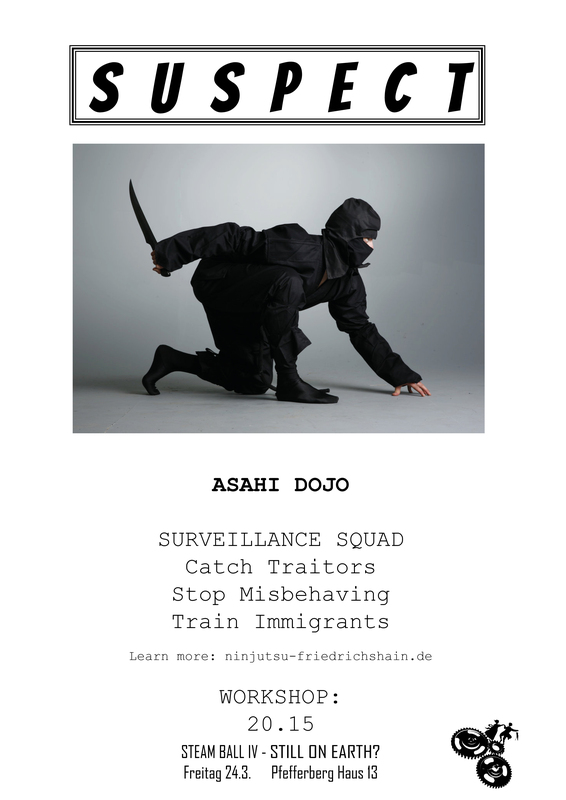 Asahi Dojo – Ninjas. Martials Workshop. Tango in Blood – Tango shows and Workshop. 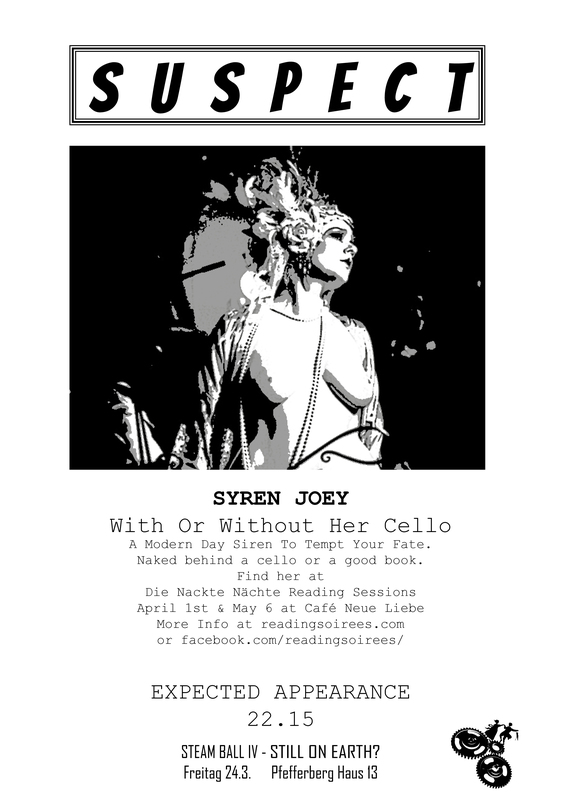 Burlesque mit Viva LaMore und Syren Joey. 3 live bands: theatrical multimedia performances between Steampunk, Cyberpunk, and Funpunk! 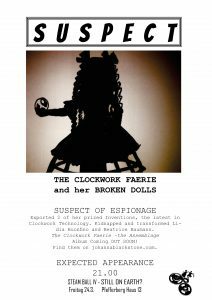 The Clockwork Faerie/Broken Dolls Act – Feline&Strange präsentieren das neue Album OUT! 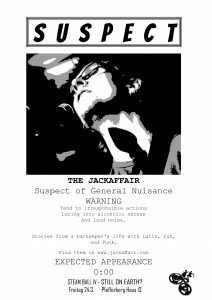 – Party live mit The JackAffair . 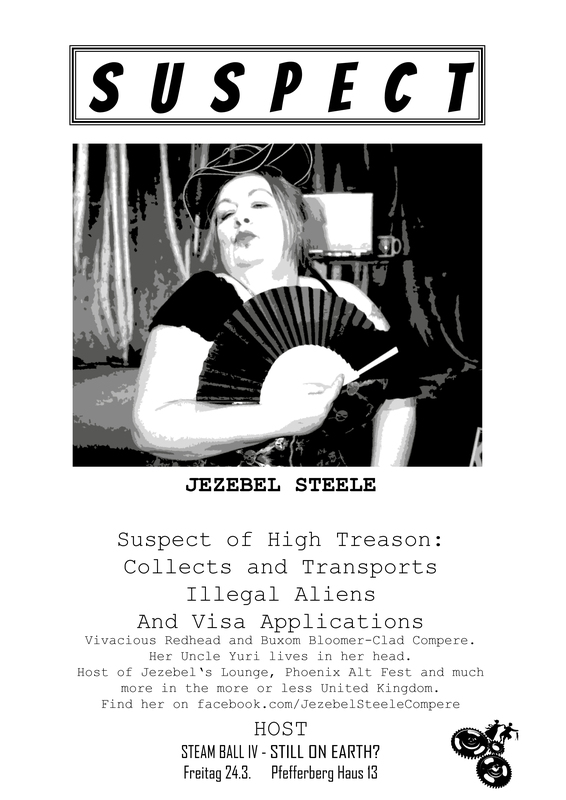 Conference: The Amazing Dame Jezebel Steele from the more or less United Kingdom! 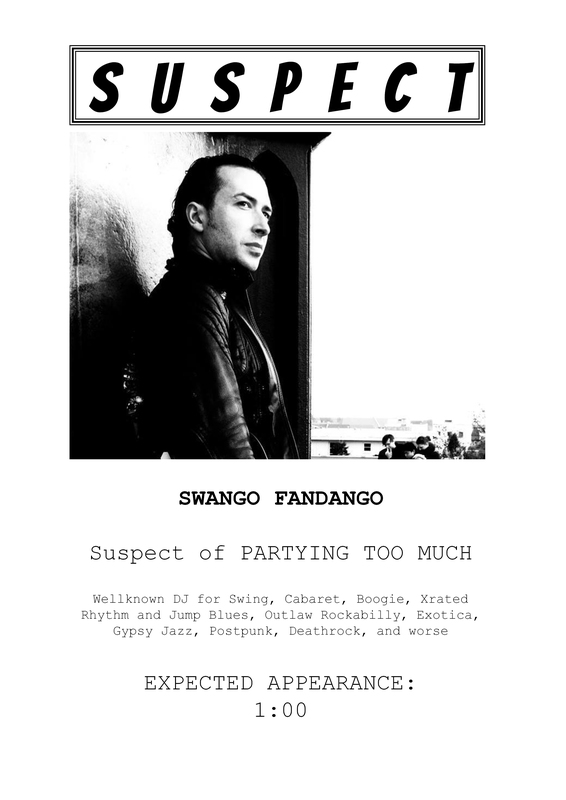 PARTY mit DJ Swango Fandango. Make-Up/Hair-Artist Anastasia Fabuljan – Photobooth mit Antonio Castello – Live Comic Artist Guido Neukamp – und: DAS SPIEL. LEARN how to fight with assassins and ninjas, and to dance with Burlesque and tango dancers. Let yourself be made up artistically to stay secret, or beautiful, and have your photo taken or drawn your portrait for: THE GAME. Your Planet Earth Visa application. WIN amazing prizes from our artists and sponsors. Eat, drink, and shop strange things. PREISE: Schmuck & Accessoires von Bloody Brilliants – Buchpaket von der Edition Roter Drache – Outfit-Piece von Nebula Berlin – Pommelier-geprüfter sortenreiner Apfelmost von most-per-post Mostquetsche Berlin – Met von Apiarium – Comics von Guido Neukamm – Tickets für das Full Moon Cabaret – und natürlich Musik von Feline&Strange! Feline and Strange Record Release TRUTHS – Hard-Chor Stimmgewalt feat. world premiere of their feline&strange cover song – The Jack Affair – Special Guest: Ila Minori from Texas – PARTY „Luftschiff“ by GOTH UNITED mit DJ Swango Fandango (Steampunk, Neoclassical, Crime Jazz, Victorian – Electroswing und Gipsy-Swing) und DJ von Stimmgewalt (Dark, Symphonic Metal, Goth) – RAVENCHILD Lightshow – – – Comte Caspar Coppelius und Christian v. Aster : Literarisch-Musikalisches Spontankabinett – TANGOTH mit Tangoshow, Workshop und Burlesque von QUINN DANGER. 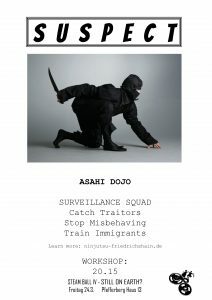 Die geheime Mission: Agentenspiel der Mitternachtsgesellschaft! themed: DARK LADIES! LAST CATHEDRAL is a dungeon… dark, scary, long, and mysterious. The acts – all female-headed – played where you didn’t expect them to play, and there have been some extra scary surprises. Das Ballhaus ist ein Relikt aus den 20er Jahren – goldener Stuck, Raucherempore, Parketttanzboden, roter Plüsch und – Tischtelephone! Entsprechend opulent kleidete sich unser Publikum!